Imagine that you are a citizen of Ephesus. The time is just over a two thousand years ago. You’re rather well off and everything in your life is just super — except that you get these terrible headaches every now and then. So you decide to try a cure across the water on the island of Kos, where there is a famous Aesculapion, a spa or sanatorium in today’s terms. It’s an impressive place, with temples, baths, a gymnasium and treatment rooms. At the temple, you invoke the healing gods Apollo, Aesculapius, Panacea, Hygeia.. You pay your dues with a small bag of coins, and finish the day with a hot cup of chamomile tea. But the most critical part of your pilgrimage takes place now. You make your bed in the hostel for the sick, a place where holy snakes shimmer across the floor throughout the night, and sacred dogs come to lick the wounds of the invalids. 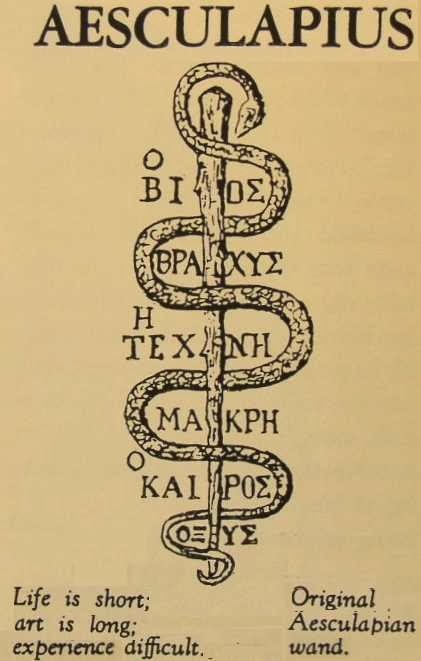 You close your eyes and wait for the physician-god Aesculapius, with his snake and rod, to visit you in your dreams. The following day, a doctor visits you to record your dreams and make a diagnosis based on what you tell him. He may prescribe a mud bath or a tonic – let’s hope he does not suggest trepanning! Now, imagine that you are a wealthy Viennese lady around 1900, and you are having the most frightful headaches. Your good friend Liselotte tells you there’s this terrific doctor called Sigmund Freud who’s just marvellous at curing head problems — and so chic. You make an appointment, you lie on his couch, you tell him your dreams. And he makes a diagnosis based on them. The astrological Aesculapius is the asteroid Chiron, who, in my experience, is certainly associated with both wounding and healing, and specifically with pain — physical, emotional or spiritual. Both transits from Chiron and Chiron’s natal placement tell of this. For more on Chiron, click here. Chiron has an erratic orbit. This means he spends wildly different amounts of time in each sign, and he spends the longest period in Pisces — where he is now. He will be in the sign of the fishes until 2O19, that will be a total of nine years. In contrast, he spends just one year in Pisces opposite sign Virgo. This is particularly interesting since many astrologers believe that Chiron should be given to Virgo. Pisces is the sign of dreams, the collective unconscious. Chiron is here for all of us now. Until three days ago, Chiron was in retrograde motion – and had been since March, but now he is crawling forward again. Now this is important: he has been in tight aspect to the U-Plu square: sextile Pluto and semi-sextile Uranus, placed between these two old kings. All month, he has been in exact aspect to Pluto, plugged straight in to that dark energy. Pay attention to your dreams now. In your dreams, you may find the seed of a cure. Weirdly, I dreamt of a large snake last night! Chiron has been opposing my Mars for quite some time now and Neptune squaring my Neptune. I am having ultra-vivid and epical dreams! Wow, Christina. 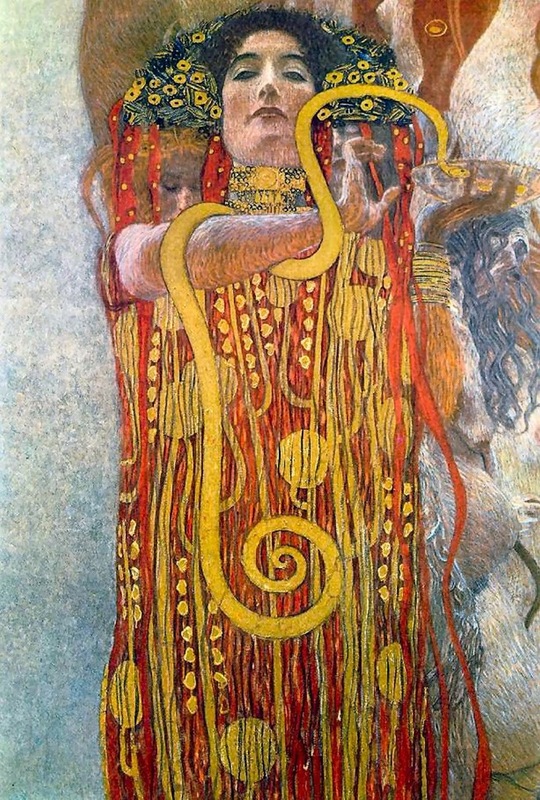 Love this piece & the wonderful Klimt art. Thank you once again. So interesting, Christina. I always thought of Chiron being a sort of martyr, healing our wounds while himself suffering, but never associated him with anything that might happen TO us. When I clicked back to your “Achilles heel” post and read what happened to you, I ran a transit for 12 Jan 2012 when a whole cascade of health problems was initiated by my toes turning purple and hurting like hell. Of course, turns out Chiron was conjunct my natal Sun … HA! Well, everything I have read says that too — that he is the Wounded Healer, a kind of lovely hippy dude who suffers and has wonderful hands – but my experience, not just personally but in chart readings, is that he also makes the wound. My local astrology group includes quite a few people who are having Chiron transits to the Sun – all are currently (and temporarily we hope in pain and one is seeing a chiropractor for it…. Yeah, well sweetie-pie Chiron landed me in the hospital (guess you’d say “in hospital”?) in May 2012, diagnosed with a nerve condition that left me unable to walk (excruciating pain in left leg tag-teamed with that leg’s tendency to suddenly fall asleep and buckle — never a dull moment!). Back on my feet now, thanks to meds. Also I think it helps to let go of the fear that comes with the pain and try to float along the surface of the experience, a la Montaigne (also a Pisces). Hope all the members of your group are doing well now. Oxford is full of Pisces – which is kind of interesting considering it’s about as far from the sea as you can get in Britain! Come visit. Members of the group are all still in the thick of it. Yes, fear is also an element here. Good point. I think astrologers who think Chiron should rule Virgo should have their heads examined! I’m willing to bet most are male. No way the only sign with a woman should be ruled by a male half-beast. We don’t know enough about Chiron, it was discovered less than 50 years ago. Meanwhile, a female dwarf planet – Ceres – has been around almost as long as Neptune, and is several times larger than Pluto, and no one is rushing to give it a rulership. Of course not. It’s female. Sexism is alive and well in astrology. Oh my god Trish – you said it. I completely agree about the sexism. I’ve always thought the astrologers’ love affair with Chiron/centaurs was a boy thing. As for Chiron’s rulership, I suspect it’s a mistake to give it to any sign. This is because of the erratic orbit and also I question whether all objects actually have a rulership. However, Ceres I do give to Virgo definitely. In my opinion Chiron rules Sagitarius and Ceres rules Virgo (she has to do with harvesting and food in general). I have Chiron in Sag – I’m very good at helping other people, but when it comes to myself I never know what to do. Right now Chiron is at 9 Pisces / Pluto at 9 Capricorn (sextile) and my ascendant is at 9 Leo. Is that a Yod, Christina ? My lower back hurts like hell. This is an old wound – I once fell on my bottom – thought it had healed, but now I’m having trouble with it. Ouch! Yes and Leo rules the back… go figure…. such fun to read – and educational, too! lets hope this post gets through now that I have gmail. I cant tell you how many times I have tried to post and hit a wall. Welcome… and I’m really sorry. I don’t know how to fix this… I’ve tried! Regarding Chiron (possibly) being the ruler of Virgo despite it’s time being shortest there: Pluto spends more time in Taurus than any other sign, and it’s transit thru Scorpio is the shortest. Good point – and Pluto/Scorpio is a secure fit. Maybe Chiron only spends a short time in Virgo because he goes home only long enough to search through his books for references and pack a bag for his next journey. Doctors spend long hours away from home healing the sick and wounded. I believe that Chiron can be associated with Sag because he is a Centaur and philosophical and loves spending time there and rejuvenating himself by sharing ideas, debating and maybe engaging in a little competition (like a men’s club), but his healing properties with herbs and such are a Virgo thing…I believe he spends so much time in Pisces because he’s furthest from home and has many wounds to heal in the collective unconscious. P.S. I also have Sun conjunct Jupiter and Zeus in the 11th house – Virgo.